Now the question is: Should I replace these cabinets? It will cost a fortune! So why replace when you can refinish it! 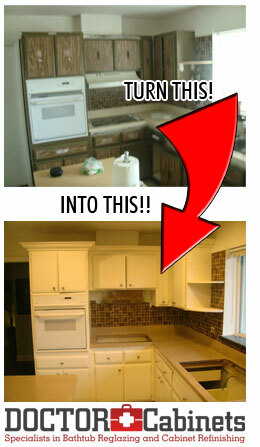 Doctor Cabinets is Boynton Beach’s #1 Kitchen Cabinet Refinishing Specialists! We are based in Boynton Beach, FL, and we serve the entire city of Boynton Beach, FL with a service that yields the highest quality when it comes to affordable cabinetry refinishing, bathtub re-glazing and counter top refinishing, appropriate for bathrooms, kitchens and many other locations.